Russia's President Dmitry Medvedev has proposed reinstating direct elections of regional governors, in a far-reaching plan for political reform. Direct elections were abolished by his predecessor Vladimir Putin in 2004, since when the governors have been Kremlin appointees. Mr Medvedev was addressing the full Russian parliament, live on television. His speech comes after tens of thousands of people demonstrated in Moscow over alleged election abuses. 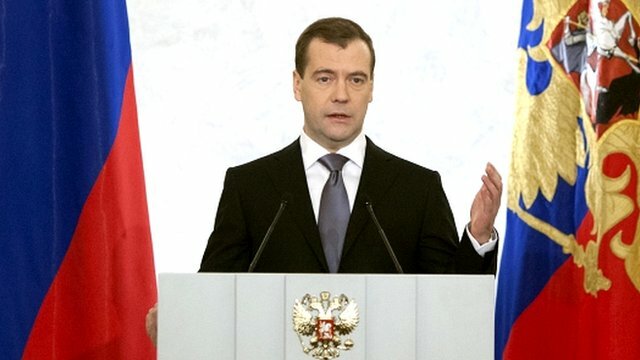 "We must give all active citizens the opportunity to take part in political life," Mr Medvedev said in his state of the nation speech - the last such speech before he steps down next March. The procedure for registering political parties must be simplified, he continued. It's clear the Russian authorities are saying that they've heard the anger of the people after the parliamentary elections and know that they are demanding change. They're saying: trust us to implement that change.This way the authorities are hoping to dampen down the anti-government anger that's been swirling for the past two weeks. Certainly these proposals would have been agreed with Prime Minister Putin, who talked about some of these things in his TV phone-in last week. Mr Putin mentioned direct elections for regional governor and said it was important for the president to act as a filter. But the devil is in the detail. "The presidential elections [next year] must be honest, transparent, responding to the requirements of legality and justice," he said. But he warned that "provocateurs and extremists" would not be allowed to create divisions in society. "Attempts to manipulate Russian citizens, to confuse them, stir up divisions in society are unacceptable," he said. Another big opposition demonstration is expected on Saturday, amid continuing demands for a re-run of the 4 December parliamentary election. The ruling party, United Russia, lost a quarter of its seats in the vote - a big slump in its support. The reforms proposed by Mr Medvedev included the creation of a "public" television channel free from state influence. "None of the owners of this new media outlet should have a determining influence on any decision-making - neither the state nor a private owner," he said. Russia's main television channels and many other media outlets are state-controlled. Critics accuse them of playing down the opposition protests. Mr Medvedev also said he would introduce a draft law to change the system for registering a political party. Registration would require the signatures of 500 people from at least half of all the country's regions. Currently the requirement is 40,000 signatures. He also proposed that presidential candidates would need 300,000 signatures to register, instead of the current requirement of two million. Party candidates in elections would require 100,000 signatures, instead of the current two million. Medvedev's statements can be taken with a ton of salt. The real power in Russia is Putin and so far he has shown little or no interest in making real changes. All this is window ressing in an effort to entice the voters back to United Russia and Putin- and presumably also to save Medvedev's own neck. He's unlikely to remain in power as prime minister after another bad election result for UR/Putin. Medvedev is talking nonsense to please the protesters. Let the anger die down, and watch the suggestions be forgotten. There was a reason that elections for regional governors and signatories for candidacy and parties was increased (and the allowed margin for error decreased) under Putin - so he could consolidate his power in the Kremlin. Luckily with the runet becoming bigger, things will change. Medvedev's recommendations are fair, reasonable. I believe will do much to alleviate tension. I especially like creation of a "public" television channel free from state influence. Politically thing are easing up in Russia. It seems to me that Putin & Medvedev are aiming to short-circuit colorful, external rabble-rousing while responding to legitimate, democratic concerns of Russian People.